Shubert Theatre, 225 West 44th Street, New York City. Reviewed by Lucy Komisar April 12, 2013. The Birthday Party. Photo by Joan Marcus. A hit Broadway musical in favor of intellectualism and rebellion, that’s a welcome surprise in New York where this season’s best new musicals about people who challenged the system – “Chaplin” and “Scandalous” (about Aimee Semple McPherson) — had short runs. Though of course, this production comes from London and it’s a fantasy, not about real events. Well, not about overtly political events. But it’s about stultifying intellectual repression. From the point of view of children! If you have kids, take them. And if you don’t, go anyway. It’s a play for adults, too. 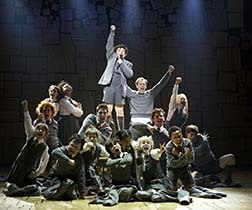 “Matilda” is based on a story by Roald Dahl, with book by Dennis Kelly and music and lyrics by Tim Minchin. Director Matthew Warchus has organized a social-political fantasy that is as trenchant as it is entertaining. In the tradition of “Alice in Wonderland,” Matilda, the little girl heroine, views grown-up ideas through the prism of what kids see. This is a society that in spite of the opening birthday party cooing is cruel to children. That goes with being anti-intellectual. Well, we know bad people are that way. Expand this beyond child victims to the whole society. 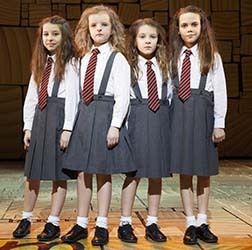 Bailey Ryon, Milly Shapiro, Sophia Gennusa, Oona Laurence. Photo by Joan Marcus. 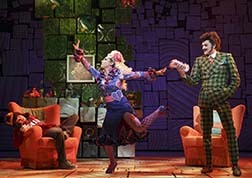 Matilda’s mother, Mrs. Wormwood (Lesli Margherita) – of course, it’s a Dickensian name — screams and covers her ears. Her father (Gabriel Ebert) says, “Stop scaring your mother with that book, boy!” Matilda declares, “I’m a girl.” Talk about sexism: he can’t even acknowledge her gender! Taylor Trench as Michael, Lesli Margherita as Mrs. Wormwood, Gabriel Ebert as Mr. Wormwood. Photo by Joan Marcus. The creepy son Michael (Taylor Trensch), whom they dote on, is nearly comatose, spending his time watching TV. He sings in a dummy voice, “All I know I learnt from telly. The bigger the telly, the smarter the man.” He wonders why he should waste energy reading Ulysses when he could sit happily “watching slightly famous people talking to really famous people.” A knock on the mind-numbing celebrity culture. Yeah! The politics of the play is etched in satire through the absurd shticks. Transpose this to the citizens of a country run by malevolent authoritarians who rule over cowering dolts. Parents and son, dressed in garish costumes by Rob Howell, scream at each other. Matilda escapes to her books. Dickens, Tolstoy, Dostoyevsky and Dr Seuss the Cat in a Hat. She is a prodigy. So, by the way are the 9- and 10-year-old actresses who share the girl’s billing. They have a lot of lines to learn. Kids going off to school. Photo by Joan Marcus. Matilda is pretty cynical about the classics she reads. “Jack and Jill went up the hill to fetch a pail of water, so they say. The subsequent fall was inevitable. They never stood a chance – they were written that way, innocent victims of their story.” So, here is a kid challenging the life scripts written by grown-ups. Her take on Romeo and Juliet is “that love and fate and a touch of stupidity would rob them of their hope of living happily. The endings are often a little bit gory. I wonder why they didn’t just change their story.” Challenge and change is the message. She and other children go off to school, which is presented as jail, at least the way some grown-ups run it. The sign over the entrance gate says “Crunchem Hall.” The set is a library of high book shelves that turns to reveal piles of blocks emblazoned with letters. Rob Howell’s sets are dazzling. 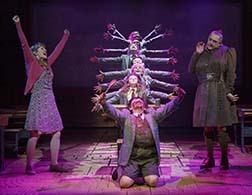 Karen Aldridge as Miss Honey, the kids with Jared Parker as Nigel, Bertie Carvel as Miss Trunchbull. Photo by Joan Marcus. There’s a great dance movement as the new students enter, with the little kids harassed by older ones. The music is not rock; it’s more like Sondheim. No nasty ear-splitting screeches here. The evil school master is Agatha Trunchbull (a brilliant Berlie Carvel in drag), in brown garb that reeks of the military. 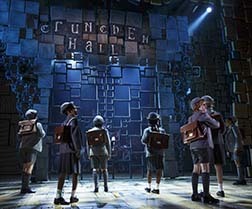 Trunchbull, with a harsh raspy voice, refers to the children as maggots and toads. “She” says “To teach the child, we must first break the child.” In “her” office, stacked cabinets hold trophies to “throwing the hammer.” (Is that a sport?) Trunchbull gleefully sings about a punishment cupboard lined with nails and glass. To show that she can do it, she grabs a girl by the braids and forcefully twists and spins her around. 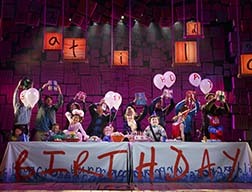 A boy, Nigel (Jared Parker), steals a slice of chocolate cake, and Trunchbull makes him eat the whole cake. There ensues a syncopated chocolate cake dance that evokes Fosse. The talented Nigel does a gospel style freedom number to a rock beat. The kids win a small victory by playing revenge tricks on Trunchbull, who smells “the odor of rebellion, the stench of dissent.” Carvel does a terrific torch song with high kicks. And the boys and girls run through jivey acrobatic dances, choreography by the excellent Peter Darling. And the kids revolt. Photo by Joan Marcus. On the other hand, the teacher, Jane Honey (Lauren Ward), with a bell clear soprano and a Dickensian name that reflects her caring for kids, encourages the child. Matilda listens and sings that “Just because you find that life’s not fair, it doesn’t mean that you just have to grin and bear it.” However, she is not naïve. The play is full of struggles.. The play is sometimes hokey, with portentous music for evil Trunchbull and flashing red lights, smoke and green laser beams. And one can’t always comprehend all the words through the children’s British accents. Though I quite understood Matilda’s Russian when she gets her father out of a scrape with some Moscow Mafiosi. The essential liberating message comes across loud and clear.